Administration Panel: If you really want to know more about the Administration Panel of Lefora, simply create an account and a forum there. Accounts and Passwords: You could create yourself your account to the demonstration forum, or use an existing account you have on Lefora. Due to the special kind of forum software Lefora provides, the demonstration forum could not be hosted to our dedicated server. The support is available directly to the Lefora website. 6 years 2 weeks ago. 7 years 42 weeks ago. 8 years 3 weeks ago. 8 years 16 weeks ago. 9 years 25 weeks ago. Lefora Team was fed up to see that major message boards, like vBulletin and PhpBB (to not quote them) were lacking important features, even if they are used everyday, for so much reasons. 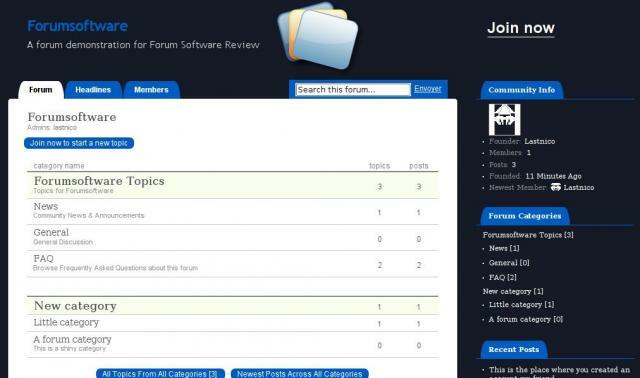 To avoid creating another new classic forum software, they decided it was time to improve the global way of managing communities, and the created Lefora, one of the first free forum hosting service, if you do not count the old BulletinBoards. Lefora Free Forum statistics are quite impressive: more than >14 millions posts, >130,000 forums, >2,000,000 visits per month. This forum hosting is really reliable, and as you can see from these metrics, people trust them. Lefora is recommended for Large Community. The hosted architecture does not force us to know and consider the technologies used behind the scene. This is an advantage for beginners. Please note that all posts could also be displayed on the same page, to follow on a global page the general activity of the forum. Some details about Lefora features regarding members. Please note that the Anonymous posting is not enabled by default, and you just need to activate it through the Administration panel. The Captcha security is considered as true, but spam bots fighting is done by a Bayesian filter (like in any modern mail client), on server side. It uses more server power, but it is easier and more comfortable for users. Leaderboards and support for video inside topics have been added to the base of the forum software. Convert an existing forum to Lefora. The free service provides a 2GB upload limits, which is quite huge to start a forum. Web crawler will navigate to your forum software easily (url rewriting, good HTML semantics). Of course, integration with Facebook, Myspace, and Twitter is also available for each users. Badges, which could be compared to user ranks, can be embedded on other sites or forums to show your status and ranking within your forum. Does Lefora correctly follow (X)HTML and CSS norms? That's right, the solution provided by Lefora is extremely efficient, simple and inventive. The only point that could be discussed is the fact that your forum totally depends on an external provider, and if in the first months of your community, this has strictly no problems, it could be a little bit annoying later. In any case, the Forum Software Reviews team has really been interested and is quite sure that Lefora, and hosted forums solution are the future. Compare Lefora vs PhpBB 3 vs Simple Machines 2. Ask your questions to the Lefora Community Forum. Get Users Reviews about Lefora and Share your experience. The forum is full of potential. But, there are too many bugs currently. Better go for more established free forum players and check back in 2 years time. Hi androi and psych, i'm one of the guys behind Lefora, sorry to hear you had problems. Since March we've have made a number of releases fixing issues we were made aware of and adding tons of new options, like automatic badges that your members can embed on their own website. We also just had a major release, Lefora 2.0 a few weeks ago and we have big plans for 2010! Best wishes to you and your forum, wherever they may be hosted. Lefora forums are just about as bad as it can get. For several months pictures have failed to upload, which is a problem in my sport. We have complained DOZENS of times and are told "someone is looking into it." BS. They collect our subscription money and do nothing whatsoever. HORRIBLE. RUN FOR YOUR LIFE! Well, it's blocked in China and not fast for my proxy. Spent a lot of time setting up this site only to have it shut down w/no warning or notification because (and I have to assume as no reason was ever given) it was business related. I was trying to get my company hooked on the idea of better internal communication through this medium but I think with this kind of service (just shutting it off w/o any warning or notification) that it's better off to just host your own. Stay far away...these guys are a new start up and apparently they have NO investment in customer service. Lefora is a joke. Now for the last few months, they've been using a VERY INTRUSIve Captcha checking at sign in. I do not want to listen to a damned video advertisement, and then have to type in an advertizing slogan to log in. Are they that fricking cheap that they have to make money that way? I am about to pull my several forums off Lefora. All day today, it says that a Captcha sign-in match is needed, but there is no such Captcha window. if you click, it continues to tell you it is a Captcha mismatch, but still doesn't provide a Captcha window. That's exactly why I will never switch to Lefora. I can understand them making users fill in captcha during registration. But registered member and forum admins should not have to fill in captcha. I made a test forum on Lefora but I can tell you,Lefora is not very customizable or user friendly. I don't see why an admin should have to fill out captcha on their own forum that they created.